In celebration of Canada 150, Vancouver Asian Film Festival (VAFF) is launching the Canada 150 / China Scriptwriting Competition in partnership with China’s CNH Management Ltd., to better reflect Canada’s diversity across the country’s feature filmmaking landscape. The winner will receive a cash prize of CAD$10,000 after signing a contract assigning CNH the right to own and develop the winning script, for production and distribution. VAFF is Canada’s longest-running international Asian diaspora film festival, now in its 21st consecutive year. A non-profit organization, VAFF is dedicated to promoting and celebrating the diversity and depth of Asian culture and identity in film and media, and to help North American Asian actors and filmmakers more authentically and more powerfully define and express themselves on screen. Through its annual film festival and many other programs and events hosted in Vancouver, VAFF’s mission is to be the “go-to” forum for the public and the film industry to engage in and support the rise of Asian influence in film and media in the world. VAFF envisions a world where North American Asian actors and filmmakers have the resources and opportunities to shape mainstream culture in a powerful and positive way. CNH Management Ltd. is an international investment company expanding into the film and television industry. Now with an office strategically located in Vancouver’s “Hollywood North,” and with strong experience and resources both in the Chinese film industry and investment field, CNH provides a professional platform connecting Canadian film talent (producers, directors, scriptwriters, performers, crew) to Chinese investors and to the Chinese film market—with the best value and a lower amount of risk for all parties. CNH Management has affiliations with companies in media production and distribution, including Tencent, iQiyi, and Alibaba; in terms of investment, CNH has relationships with Gowlings, Lawson Lundell, and BDO Canada. THANK YOU FOR YOUR SUBMISSION. THE CONTEST IS NOW CLOSED. Fee must be submitted at time of online registration. All registrations/payments must be made by 11:59 p.m. Pacific, August 31, 2017. The pitch document may be provided at time of registration, or sent after registration to canadachina@vaff.org. All pitch documents must be submitted by 11:59 p.m. Pacific, August 31, 2017, or the registration is disqualified. Please send all correspondence to canadachina@vaff.org. 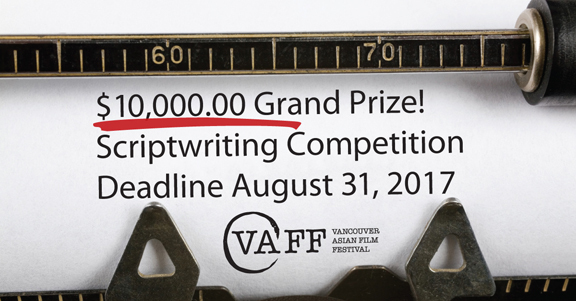 The primary registrant/scriptwriter will be considered the main representative for communications from VAFF/CNH. Individual registrants may submit and pay for a maximum of three (3) separate competition registrations/pitch documents. Any additional registrations over the maximum will be automatically disqualified. Five (5) registrations total (that score the highest for their pitch documents as determined by the adjudication panelists) will be asked to submit a script draft. If the competition receives less than 30 registrations, VAFF/CNH may choose not to proceed with the competition and all registration fees will be refunded. Members of the VAFF board, executive and committees are ineligible to compete. The primary registrant must not have had more than one feature film or more than two full length plays produced, or have written for a network or cable series and/or web series for more than thirteen (13) episodes. As the winning script may be produced by CNH Management for a Chinese or wider Asian international audience, at least one (1) listed lead actor or scripted character must be identified as being of Chinese or Asian/mixed Asian heritage. Any submitted pitch document or script draft that does not list at least one lead character/actor of Chinese or Asian heritage/mixed Asian heritage is disqualified. The competition accepts script drafts for a feature length film, television pilot, or Internet/Web series. Submitted pitch documents or script drafts should contain content that ultimately contributes toward a progressive and/or positive impression of Asian characters and cultures overall, and should not perpetuate or reinforce negative generalizations or stereotypes of Asian characters and cultures. Submitted pitch documents or script drafts must not contain subject matter that contravenes the Criminal Code of Canada, such as explicit sexual or hate content, and should be classifiable in North America with a maximum PG-13 rating (please refer to the Consumer Protection BC website for definitions and more information). Submitted pitch documents or script drafts must not contain subject matter that is overtly political or that involves specific social activism. Script drafts must be the original work of the primary registrant/scriptwriter, or of two writers who collaborated equally, and may be in both English and/or another language(s). If any portion of the submitted script draft is in a language other than English, translation is the responsibility of the submitting scriptwriter and an English translation of any non-English script portions must be provided in the submitted script draft. If this is not provided by the scriptwriter, the script will be disqualified. Competition registration remains open until the stated competition closing date/time, after which competition registration will be closed. Each registration may list up to two (2) scriptwriters total: One (1) primary registrant/scriptwriter and one (1) designated collaborative co-writer (if applicable). Registrants must submit a maximum 6-page pitch document (PDF/Word) per registration by the provided deadline, or they will be disqualified [see “Pitch Document Guidelines” for details]. The top ten (10) semifinalist registrants/pitches will be notified of their status by VAFF/CNH. The top five (5) finalist pitches will be selected from the top ten (10) semifinalists by VAFF/CNH. The top five (5) finalist registrants, as notified by VAFF/CNH, must submit the first script draft and a revised script draft (if applicable) by the provided deadline(s), or they will be disqualified. Submitted script drafts that have a significantly different story than provided in the pitch document synopsis, will be disqualified. Registrants are responsible for ensuring they have chain of title or right to use anything referenced in their submitted script draft. Pitch documents from all competition registrants must be submitted electronically to canadachina@vaff.org by 11:59 p.m. Pacific, August 31, 2017, or the registration will be disqualified. Initial script drafts (top five  finalists only) must be submitted electronically to canadachina@vaff.org by 9:00 p.m. Pacific on October 06, 2017, or the registration will be disqualified. Final revised script drafts (top five  finalists only, as applicable) must be submitted electronically to canadachina@vaff.org by 9:00 p.m. Pacific on October 31, 2017, or the registration will be disqualified. The adjudication and selection process is final. The competition winner will be announced at an award ceremony at the 21st Annual Vancouver Asian Film Festival Nov 2 – 5, 2017. One (1) cash prize of CAD$10,000 will be awarded to the primary registrant/scriptwriter of the winning script submission after signing a contract assigning copyright of the script to CNH. The top five (5) finalists, including the competition winner, will be promoted by VAFF through its marketing channels, and there may be media interview and other promotional opportunities. The pitch document is a proposal for your script draft. Each primary registrant must submit one pitch document per registration, to a maximum of three (3) registrations/pitch documents per registrant. The pitch document must not be longer than 6 letter (8/5” x 11”) size pages, single spaced, and be submitted as a single document in PDF (preferred) or Word format. Statement of Intent: Describe how your experience of diversity has influenced your storytelling. Describe your rationale for the script (why you wrote the script/what inspired the theme or subject matter). Include the primary registrant/scriptwriter’s name (as provided in your registration) and the name of any collaborative co-writer. Brief CV: Of the primary registrant/scriptwriter, and any collaborative co-writer. Breakdown: Character breakdown and potential casting choices for the lead role(s). Logline: A one-sentence summary that states the premise and central conflict of the story, including an emotional “hook” to stimulate interest. Long synopsis: Include all essential beats/plot points and important elements of your story — characters, storyline, actions, reactions and major incidents — from beginning to end in the chronological order events occur and characters are introduced. Include the ending of your story. Confirm that your script is the original idea of the primary registrant/scriptwriter, or of the primary registrant/scriptwriter and the listed collaborative co-writer. Whether your script is based on a real event or person. Any specific logos, trademarks, trademark names, or copyrighted music and songs used in your script. Any potentially ambitious elements in your story, e.g. an out-of-country location or scenes involving stunts or a large number of cast/extras. Your synopsis is a sales tool that should make the adjudication panelists eager to read your full script: Make your synopsis as compelling, essentially detailed, and cinematically descriptive as you can. The script draft should be submitted in standard screenplay/teleplay format. Do not include the primary registrant’s or co-writer’s name, address, phone number or any other identifying information on the title page, or any other page of the script. Your script draft format should either be exactly as provided in the sample, or close enough so that your script resembles the formatting in the provided sample. Some formatting may vary slightly, such as using slightly different margins or indentation. Use 12-point Courier, or a slight variation (some programs or computers have Courier Prime, Courier New, Courier Final Draft, etc. installed instead of Courier). Courier is a fixed-pitch font, so each character and space is exactly the same width. Consistent spacing is important since standard screenplay/teleplay format is designed so one page equals approximately one minute of screen time. Most scriptwriting software (such as Final Draft) will default to 12-point Courier. Don’t include scene numbers, minimize use of designated camera shots, and write your sequences and stage directions as “master scenes.” Submission scripts, sales scripts, and first draft scripts follow those guidelines. “Shooting scripts” (the format in which scripts are most often available online, in books, and at libraries), are not the format in which most professional writers submit their scripts. Go for clarity: If your script’s format can be easily read by anyone working in the film industry, then it falls within acceptable standards. There is no absolute standard format within the North American film industry but if you’re confused about what formatting is acceptable, it’s best to follow the provided script format sample as closely as possible. The submitted script draft must be the original idea and work of your primary scriptwriter. If the submitted script draft is based on a real person or event, this must be mentioned in the pitch document statement of intent. Registrants may submit material that is based on their own previous work, but may not submit material that is based on a previously published/broadcast/staged work by others. Work in the public domain (including work created by people who have been dead more than 50 years) can be used without obtaining chain of title documentation or written permission. Rights to submitted script drafts that do not win the competition, remain the property of the scriptwriter(s). CNH Management may offer to option any of the other submitted script drafts that do not win the competition, at a price and terms mutually determined by the scriptwriter(s) and CNH Management. The winning script draft will become the property of CNH Management, to develop and potentially produce and distribute in part or in entirety. CNH may, at its discretion, have all or part of any winning or optioned script translated from its submitted language. The winning scriptwriter(s) will have the option to purchase copyright of the script back from CNH Management if the script is not being developed or produced by CNH five (5) years from the day the prize money is awarded. CNH may not charge the scriptwriter(s) more than the cash prize amount received. If a film is produced from the script, CNH Management will credit the winning scriptwriter(s) as the original writer(s) on the film. If the submitted pitches or scripts do not meet the VAFF mandate and mission criteria, or do not meet CNH Management criteria, VAFF/CNH reserve the right to not select a winner.